A British scientific expedition has discovered the world's deepest known undersea volcanic vents, called 'black smokers', 3.1 miles (5000 metres) down in the Cayman Trough in the Caribbean. Using a deep-diving vehicle remotely controlled from the Royal Research Ship James Cook, the scientists found slender spires made of copper and iron ores on the seafloor, erupting water hot enough to melt lead, nearly half a mile deeper than anyone has seen before. 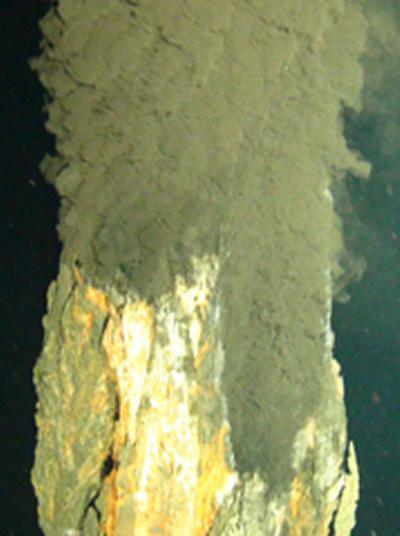 Deep-sea vents are undersea springs where superheated water erupts from the ocean floor. They were first seen in the Pacific three decades ago, but most are found between one and two miles deep. Scientists are fascinated by deep-sea vents because the scalding water that gushes from them nourishes lush colonies of deep-sea creatures, which has forced scientists to rewrite the rules of biology. Studying the life-forms that thrive in such unlikely havens is providing insights into patterns of marine life around the world, the possibility of life on other planets, and even how life on Earth began. The expedition to the Cayman Trough is being run by Drs Doug Connelly, Jon Copley, Bramley Murton, Kate Stansfield and Professor Paul Tyler, all from Southampton. They used a robot submarine called Autosub6000, developed by engineers at the National Oceanography Centre (NOC) in Southampton, to survey the seafloor of the Cayman Trough in unprecedented detail. The team then launched another deep-sea vehicle called HyBIS, developed by team member Murton and Berkshire-based engineering company Hydro-Lek Ltd, to film the world's deepest vents for the first time. "Seeing the world's deepest black-smoker vents looming out of the darkness was awe-inspiring," says Dr Jon Copley, a marine biologist at the University of Southampton's School of Ocean and Earth Science (SOES) based at the NOC and leader of the overall research programme. "Superheated water was gushing out of their two-storey high mineral spires, more than three miles deep beneath the waves." He added: "We are proud to show what British underwater technology can achieve in exploring this frontier - the UK subsea technology sector is worth £4 billion per year and employs 40,000 people, which puts it on a par with our space industry." The Cayman Trough is the world's deepest undersea volcanic rift, running across the seafloor of the Caribbean. The pressure three miles deep at the bottom of the Trough - 500 times normal atmospheric pressure - is equivalent to the weight of a large family car pushing down on every square inch of the creatures that live there, and on the undersea vehicles that the scientists used to reveal this extreme environment. The researchers will now compare the marine life in the abyss of the Cayman Trough with that known from other deep-sea vents, to understand the web of life throughout the deep ocean. The team will also study the chemistry of the hot water gushing from the vents, and the geology of the undersea volcanoes where these vents are found, to understand the fundamental geological and geochemical processes that shape our world. "We hope our discovery will yield new insights into biogeochemically important elements in one of the most extreme naturally occurring environments on our planet," says geochemist Doug Connelly of the NOC, who is the Principal Scientist of the expedition. "It was like wandering across the surface of another world," says geologist Bramley Murton of the NOC, who piloted the HyBIS underwater vehicle around the world's deepest volcanic vents for the first time. "The rainbow hues of the mineral spires and the fluorescent blues of the microbial mats covering them were like nothing I had ever seen before." "Our multidisciplinary approach - which brings together physics, chemistry, geology and biology with state-of-the-art underwater technology - has allowed us to find deep-sea vents more quickly than ever before," adds oceanographer Kate Stansfield of the NOC. The team aboard the ship includes students from the UK, Ireland, Germany and Trinidad. "This expedition has been a superb opportunity to train the next generation of marine scientists at the cutting edge of deep-sea research," says marine biologist Paul Tyler of SOES, who heads the international Census of Marine Life Chemosynthetic Ecosystems (ChEss) programme. The expedition will continue to explore the depths of the Cayman Trough until 20th April. The team are posting daily updates on their expedition website at http://www.thesearethevoyages.net/, including photos and videos from their research ship. "We look forward to sharing the excitement of exploring the deep ocean with people around the world," says Jon. In addition to the scientists from Southampton, the team aboard the ship includes researchers from the University of Durham in the UK, the University of North Carolina Wilmington and the University of Texas in the US, and the University of Bergen in Norway. The expedition members are also working with colleagues ashore at Woods Hole Oceanographic Institution and Duke University in the US to analyse the deep-sea vents. The expedition is part of a research project funded by the UK Natural Environment Research Council to study the world's deepest undersea volcanoes. The research team will return to the Cayman Trough for a second expedition using the UK's deep-diving remotely-operated vehicle Isis, once a research ship is scheduled for the next phase of their project. The expedition aboard the RRS James Cook began in Port of Spain, Trinidad on 21st March and ends in Montego Bay, Jamaica on 21st April. It is part of a £462,000 research project funded by the UK Natural Environment Research Council (http://www.nerc.ac.uk).